1. Large emboli occlude larger arteries leading sudden enlargement of right ventricle (cor pulmonale) leading to syncope or sudden death. 2. In normal circulatory system when small emboli block the smaller pulmonary arteries, it will not result in infarction, because normal bronchial arterial supply fulfills the requirement of lung parenchyma, in this case only Pulmonary hemorrhage will be there. Bronchial arteries arise from aorta and supply lungs. therefore, lungs have dual blood supply, one comes from the left ventricle through bronchial arteries and the other comes from the right ventricle through pulmonary arteries. 3. In case of abnormal circulatory system (that is heart or lung disease) small emboli cause infarction. 5. On chest X ray, infarcted zone is wedge shaped with its base at the periphery of lung and apex pointing towards the hilum. 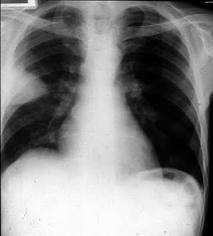 Chest X-ray showing wedge shaped Pulmonary infarction on th right side. 2. Hemodynamic compromise: Blood pressure will decrease. In Case Of Large Emboli. 9. Syncope or sudden death.